I used the Positive Feedback round as a debrief for the last freeform I ran, and people liked it a lot. The purpose of the exercise is “both to improve your gaming skills, build a culture of communication and trust, and learn how to give and receive feedback”. I love that the player who is currently receiving positive feedback is not allowed to reply or comment. Just sit there and take your compliments! It’s awkward and a little scary, but the exercises leaves happy players and for a tough game, that’s a great bonus. Highly recommended! 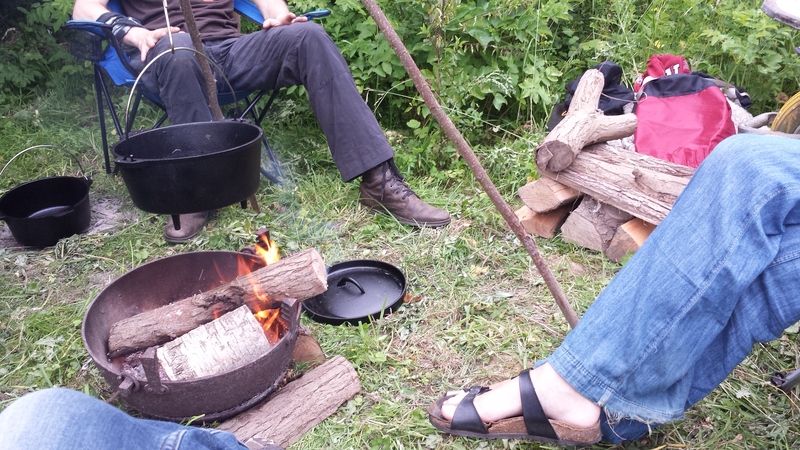 We got to play a Campfire game with Bart, Marie and Tim in the back of Marie’s huge bewildered garden. America, 2015, Spring Break. We’re all studying at Calorado U and won a competition for a Camping Trip to Colorado lake. We arrive in a minivan and are stuck in nature for a weekend. We awkwardly hang out and play truth or dare, go swimming and try to have a good time. Great touches were Marie’s weed cookies that got everyone nice and worked up, and Jan’s attempts at subtly finding out if Tim’s character was also gay. I don’t really know the Critical Success podcast by James D’Amato, but this episode got linked somewhere and I loved it! It’s all about how to do character voices in a low-effort, natural type of way. As someone who mostly GM’s one-offs and who struggles to come up with new voices every time, concrete advice is pretty welcome.